I call this “Frittata Style” because my non stick skillet is not oven safe, so the whole dish is cooked stove top rather than finishing in the oven like a real frittata. 1. In a medium sauce pan, cover the diced potatoes with cold water and let stand 5 minutes while you dice the onions. Drain the starchy water off the potatoes and replace it with fresh cold water. Add a generous teaspoon of Kosher salt and bring the water to a boil. Boil for 5 to 7 minutes, until the potatoes are just tender. Pour the potatoes into a wire strainer and set aside. 2. In a 9″ non stick skillet over medium heat, melt the butter and olive oil. Sauté the onions until slightly softened. Add the diced potatoes in an even layer, but do not stir. Brown about 5 minutes. 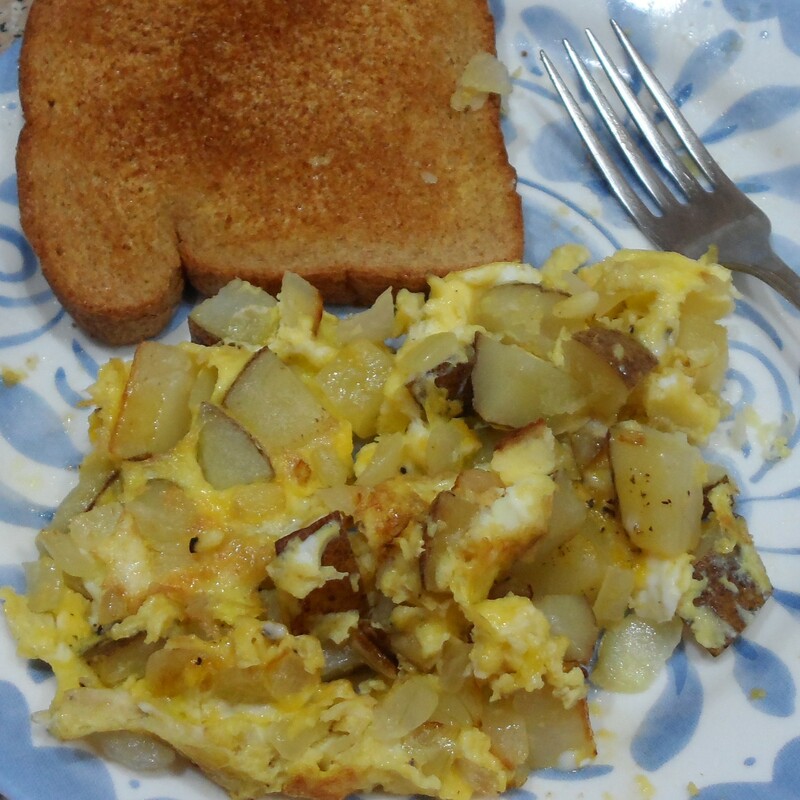 Gently pour the beaten eggs over the potatoes and season with coarsely ground salt and pepper. Reduce heat to medium low and cook, without stirring, until the eggs are nearly set. 3. Carefully slide the egg mixture onto a large dinner plate. Invert the skillet over the plate and using hot pads flip the plate and skillet so the eggs go back into the skillet. Continue cooking just a couple of minutes more, as desired.